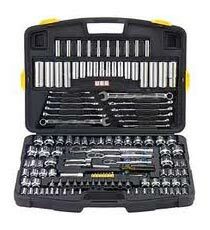 We have made our mark as Importer and Supplier of Stanley Tool Kit from Maharashtra, India. Our wide range includes Telecommunication Kit, Speciality Tool Kit, Electricians Tool Kit, Specialty Tool Kit For Home Use & Basic Tool Kits. Also, items like Water Proof Tool Bags, Pliers, Cutting Tools, Measuring Tapes, and others are included. Whether it is a small order or bulk, we are focused to deliver the required order within the stipulated timeframe.